ABOVE: Outside the hotel Wyndham Grand Bay 4-Star Hotel on South Bayshore Drive. This page allows you to find directions, post a comment, read reviews, and check rates at the Grand Bay Hotel. Rates: Low season from $120. High season from $225. The Wyndham Grand Bay is a tropical paradise overlooking Biscayne Bay. Unwind by the pool, pamper yourself at the spa, and dine at BICE restaurant. The hotel is within walking distant to the upscale shops and restaurants at Cocowalk. The guest rooms offer beautiful waterfront views and pillowtop mattresses, helping you to relax after a day of activities. Wireless Internet access connections are available in all guest rooms and public areas of the hotel. Click HERE for Wyndham Grand Bay Lodging Information. • Leaving the Airport, follow signs to 95 South, which becomes US-1. • Take US-1 to SW 27th Ave. and turn Left. • Proceed to South Bayshore Drive and turn Left. • The Wyndham Grand Bay is on the Left side of the street. 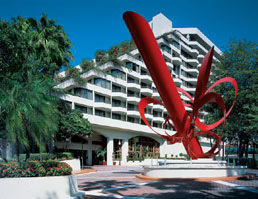 The Wyndham Grand Bay is located on 2669 South Bayshore Drive in Miami, FL 33133. Use our Miami hotel map to find the exact location. Wyndham Grand Bay in Miami. Miami hotel reservations.